Summary: The Lasertron Brush's provides one of the most effective regimens available for the treatment of hair loss. Men and women across the country have experienced the benefits of the Lasertron brush. It's a technological breakthrough designed to satisfy your desire for thicker, fuller, and healthier looking hair. This technology is so cutting edge that the Lasertron Brush is currently undergoing clinical testing at a United States Medical Institution, and has worldwide patents pending. Four types of treatments have been used in the past to address problems of hair loss. These treatments include Low Level Laser Light, Galvanic Treatment, Live Enzyme Cleanser, and DHT (Dihydrotestosterone) Inhibitors. Perhaps you've heard about some of these solutions, and how time consuming and expensive they can be. But now, they've combined all of these treatment solutions into one, with an easy to use brush for men and women. They've been able to keep the cost remarkably affordable. Most long-term hair treatments can cost thousands of dollars. Lasertron can give you the results you desire, for just $175. And you don't need to wait for several months or even years to get “long term” results. With Lasertron, most will experience visible results within 12-16 weeks. Of course, if for any reason the Lasertron Brush doesn't meet your expectations, you may send it back for a full refund (less s+h). The Lasertron Brush's combination of low-level laser light, a DHT blocker, along with Galvanic and Live Enzyme cleanser provides one of the most effective regimens available for the treatment of hair loss. 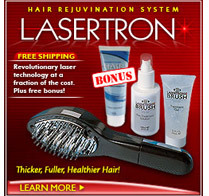 With Lasertron your hair should appear visibly thicker, fuller, and healthier within 12-16 weeks.